Arthur Monk. RPPC. Private Collection. Arthur’s eyes come through even in sepia. Beautiful! This gentleman is IDed on the back of this real photo postcard, unfortunately there are too many Arthur Monks born in his time period to find out who he was. Too bad. Late 1910s portrait. RPPC. Private Collection. Young gentleman in dress shirt, most likely from the late 1910s. He looks a bit jaded. Cabinet card of young man. Private Collection. This fellow with the proud expression and very dark eyes is wearing a wide open version of the wingtip collar with a thin bowtie. Amazing how many variations of collars and bowties/cravats and ties existed…Men’s fashion was all about the accessories. This is a nice card in great condition, and with uncommon grooves on the edges. Photographer: E. Ostrander. Spring Green. Wisconsin. Blank back. Digital restoration work titled 1890s Proud Young Man With A Wide Open Wingtip Collar by Caroline C. Ryan is licensed under a Creative Commons Attribution-NonCommercial-NoDerivatives 4.0 International License. Detail of vignette RPPC. Private Collection. In an effort to look serious this pretty one in a nailhead patterned suit came out a bit broody under the tilted hat! Still a cutie! 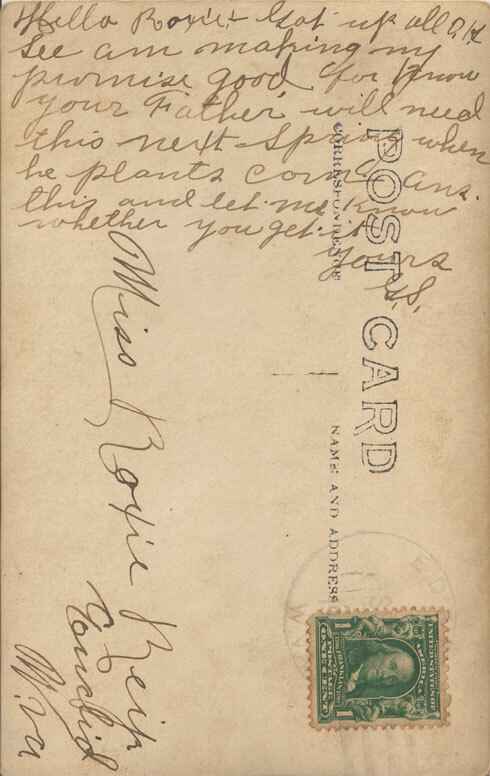 This RPPC vignette is on the left half of the card, leaving enough space for messages to the right.